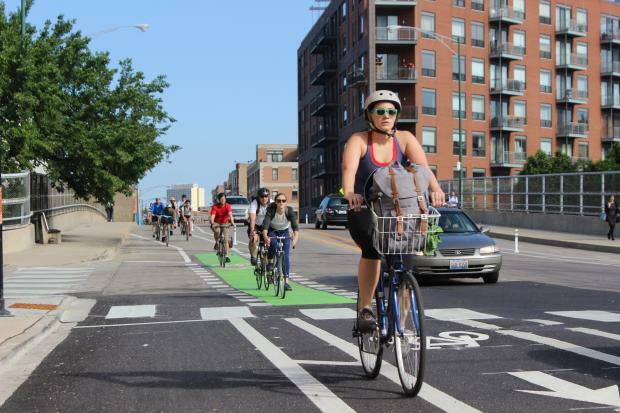 Protected Bike Lanes Opened on Stretch of Milwaukee Ave.
RIVER WEST — The city on Thursday unveiled a new stretch of protected bike lanes along a portion of Milwaukee Avenue that features bike traffic signals and the city's first bike passing lane. The 0.85-mile stretch of Milwaukee between Kinzie Street and Elston Avenue is part of approximately 30 miles of protected bike lanes around the city. Department of Transportation Commissioner Gabe Klein said Milwaukee's bike lane — one of the city's "spoke routes" which provides a continuous bikeway into the Loop for commuting — is the "heaviest route in the city for biking." "So we recognize that there are people of different skill levels using it," Klein said, who added that fact is a good thing. "We want more and more people wearing regular clothes, that just want to get 'to and fro' to use it." Ald. Walter Burnett (27th) said more than 14,000 cyclists use Milwaukee Avenue daily. "That's a lot of bikes," he said. Burnett said the protected bike lanes will make Chicagoans — including his wife — feel safer riding in the city. But Burnett said the protected bike lanes and bike traffic signals, which are separate from the lights for autos, also will create more order for motorists and pedestrians as well as cyclists. "All of it is interrelated," Burnett said. "People are going to ride their bikes anyway, so it's best we be proactive in doing something to make sure everyone is safe and respectful." The bike lane doubles in size along the portion of Milwaukee Avenue that passes over the Ohio Street feeder ramp, allowing for the city's first passing lane. Although no more passing lanes are in the works elsewhere in the city, Transportation Department spokesman Peter Scales said the only other city to tout a bike passing lane is Portland, Ore.
Scales also said the new protected lanes will add to the more than 200 miles of existing bike lanes across the city. Ron Burke, who heads the Active Transportation Alliance, said Thursday he uses some of those bike lanes to commute from Oak Park each day. "I can tell you, the best part of my commute was when I got to Milwaukee Avenue," Burke said of the new stretch of protected lanes. Burke said he is very pleased to see the "network of advanced and protected bike lanes taking shape in Chicago." "Chicago's bike superhighway today just got much safer," he said.